A ready-to-bake treat such as North Pole Cookie Dough is the perfect hostess gift. Consider presenting it in disposable pint-sized ice cream containers. You can find them online or simply ask for a few from your local ice cream shop. Just don't forget to add a festive tag with baking instructions! Place 1 1/2 cups chocolate chips in microwave-safe dish. Microwave 30 seconds on high, stir and continue to microwave in 10 to 20-second intervals, stirring after each, until chocolate is melted and smooth. Set bowl aside and cool to room temperature. In medium bowl, whisk together flour, cocoa powder, baking soda and salt. In large bowl, beat butter and both sugars using electric mixer until light and fluffy. Add melted, cooled chocolate and vanilla, blend until fully incorporated. Add eggs, one at a time, beating well after each addition. Add flour mixture slowly; mixing until incorporated. Fold in chocolate chunks, nuts and mini marshmallows. 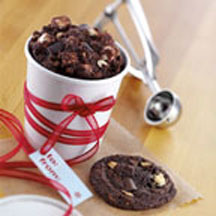 Fill pint containers with cookie dough and refrigerate up to four days or freeze up to one month. Preheat oven to 350°F (175°C). Drop dough by rounded tablespoons, or using small cookie scoop, onto parchment-lined baking sheets, about 1 inch apart. Flatten dough slightly using back of spoon. Bake 10 to 12 minutes, until edges are lightly cracked but centers are still soft. Remove from oven and cool slightly on baking sheet before transferring cookies to wire rack to cool completely. Makes 3 pints of cookie dough. Recipe and photograph provided courtesy of ButterIsBest.com; through ARA Content.